Is UV Light Safe For Pathogen Reduction In Food Processing? Whether it is high-pressure processing or enhancements to the pasteurization process, consumers are becoming more aware of the methods that improve the safety of food and beverages before they arrive in grocers’ aisles. Ultraviolet radiation (UV) — electromagnetic radiation with a wavelengths measuring from 100 to 400 nanometers — is becoming a more popular technique in decreasing or eradicating pathogens from food and beverage products. This type of radiation comes from the sun, as well as artificial means, and becomes increasingly dangerous to humans as wavelengths become shorter. UV falls into three categories, separated by wavelength. UV-A has the longest wavelength at 320 to 400 nanometers. This radiation is responsible for sunburns and is commonly linked to skin cancer. UV-B comes in with wavelengths measuring anywhere from 280 to 320 nanometers and also has a part in the tanning and burning of skin. In relation to UV-A, UV-B is much weaker. The third type, UV-C, has the shortest wavelength. Measuring between 100 and 280 nanometers, this is the type of radiation that has been used to disinfect drinking water, sanitize wastewater, and sterilize food contact surfaces. According to the FDA, UV-C at 200 to 280 is within the “germicidal range” as it “effectively inactivates bacteria and viruses.” This is due to DNA mutations that occur when UV is light is absorbed by DNA molecules. The use of UV has been part of food manufacturing for more than 50 years. Organic food is not legally able to be irradiated, but many food products — juices and apple cider, as well as grains, cheese, baked items, frozen foods, fresh fruits and vegetables, and liquid egg products, among other food and beverage items — are processed using UV-C. Grocers and other food retailers may not be aware of this due to federal regulations not requiring products treated with UV-C to be labeled, but some states do require it. Back in 2001, following E. coli outbreaks involving unpasteurized apple cider and other fruit juices, the FDA approved the use “cold pasteurization.” The issued rule required most juice-manufacturing companies to follow Hazard Analysis and Critical Control Points (HACCP) controls, UV-C’s use being an acceptable method. That rule went into effect in 2002 but excluded small juice makers, with those companies being included in the rule in 2004. UV-C is proven to reduce or eliminate E. coli, Salmonella, Listeria, and other foodborne pathogens. Just how effective the treatment is depends on exposure time, level of irradiation, and the technology used. The technology is very effective on juices as it takes very little time to get the job done — to treat 4,000 liters of juice takes less than 30 seconds. However, it took more than a decade to develop that type of efficiency as UV was only able to treat clear liquids just 10 years ago. 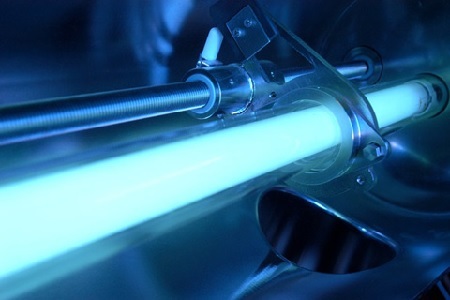 As the technology continues to develop, murkier liquids and denser food and beverage items may be able to be sterilized through UV irradiation.